This smaller version of roulette is awesome. But where can you play mini roulette online? Here's a list of casinos I've found that offer mini roulette. 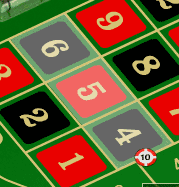 Where to play mini roulette online. Because it's exciting and weirdly enjoyable. It's refreshing to play this mini version of roulette. Before playing mini roulette I thought it would be okay at best, and not half as much fun as the standard version. I was wrong. Mini roulette is thrilling due to the fact that it's easier to follow the results on each spin. For example, let's say you place a straight bet (a bet on a single number) in European and Mini roulette. In European roulette, it's too tricky to keep an eye on both the wheel and motion of the ball at the same time, so it's incredibly difficult to predict what the final result may be. In mini roulette, fewer numbers means that you can easily anticipate where the ball is going to land, making each spin much more tense and exciting. The higher levels of awareness and anticipation make mini roulette an absolute riot. If you love playing roulette, you have to try out mini roulette. Mini roulette vs. European roulette. So what's the difference between mini roulette and European roulette (or the "normal" version of online roulette)? There are 24 fewer numbers in mini roulette. That's honestly it. Take away 24 red and black numbers from the European roulette table and wheel and you're left with mini roulette. Mini roulette is basically 1⁄3 the size of standard roulette. Here's a quick table to highlight the number differences between European and Mini roulette (and also American roulette for good measure). Note: To get mini roulette from American roulette, take away 24 red and black numbers again along with that extra green 00 number. There is only one 0 number in mini roulette. The game works in exactly the same way. Although as you can guess, the smaller set of numbers makes for a few slight differences in the betting options and payouts. If you've ever played roulette online or in a casino before you should be familiar with the betting options in mini roulette. There are no surprises – all the standard bet types are here. Nonetheless, here's a quick guide to the mini roulette betting options, which also includes the new probability and payout for each bet type. Bet on either all the red or all the black numbers. Easy stuff. Bet on either all the even or all the odd numbers. This is bet on a section of 6 numbers on the roulette wheel. In standard roulette, this is referred to as a "dozen" bet as it covers 12 numbers. Obviously mini roulette has less numbers to play with, so each bet of this type covers 6 numbers instead (so completely destroying the name of this bet type). Another difference of this bet in mini roulette is that the numbers for the 1st, 2nd and 3rd "dozens" overlap in the middle, which does not happen in normal roulette. Again, this is due to the smaller set of numbers. 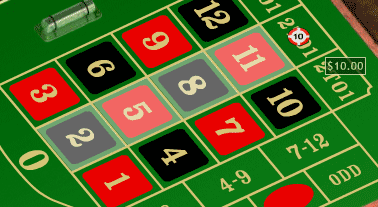 Bet on 4 numbers length-ways across the roulette table. Bet on 4 adjacent numbers on the table. The chip is placed in the corner shared by 4 numbers, hence why it's called a "corner" bet. Bet on 3 numbers in a line on the roulette table. It's a bit like a slightly smaller version of the column bet above. Bet on 2 adjacent numbers on the table. The old favourite with the maximum payout. Bet on a single number and hope for the best. The house edge on any bet in mini roulette is 7.69% (or 7.69230769% to give the full percentage edge). Therefore, the house edge in mini roulette is higher than it is in the European and American roulette variants. 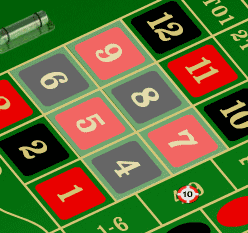 To understand why the house edge is less favourable in mini roulette, think about the ratio of red/black numbers to the single green 0 number. 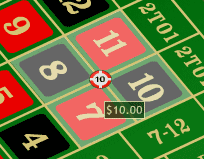 In mini roulette, the green 0 has a greater influence on your probability of losing an evens (e.g. red/black) bet. European = You lose your $10 total wager 1 time out of 37 spins. Mini = You lose your $10 total wager 1 time out of 13 spins. I don't know how helpful this example is, but hopefully it gives you an idea of why European (and even the dreaded American) roulette tables have a more favourable house edge. So whilst mini roulette is an incredibly fun game to play, I wouldn't recommend playing it if your main goal is to maximize your expectation (increase your chances of winning money) on each spin of the roulette wheel. Can you play mini roulette in real casinos? I've not seen or heard of any B&M casinos offering a miniature roulette table. It's just as elusive as the 3 wheel version of roulette. Mini roulette is a bit of a speciality game, and as fun as it is, I don't think it would be as popular as or fit in well with other casino games like normal roulette, craps or blackjack. For now is seems as though mini roulette is only available at certain online casinos, although I'd love to hear if I'm wrong!